Los Angeles is leading the nation as an example of how to deliver infrastructure investments that communities need. In elections from 2008 through 2016, Angelenos called for over $200 billion for transportation, housing, and parks. Landmark state climate legislation passed in 2008 created a powerful statewide framework for reducing greenhouse gas emissions. At the same time, Los Angeles County embarked upon a voter-approved transformation of regional transportation systems – improving and building 12 transit lines, consisting of light rail projects, subway extensions, and bus rapid transit projects. Investment began with a $40 billion sales-tax measure in 2008, and improvements will be accelerated further with an additional sales-tax measure approved in November 2016 that will generate over $120 billion. Voters have also shown support for housing and parks in 2016, passing $1 billion for homelessness in the City of Los Angeles and $100 million per year for parks across the county. In this critical moment, the way we build the places we live, work, and play should benefit all Angelenos. The Los Angeles SPARCC collaborative partners include the California Community Foundation (CCF) and members of the LA Transit, Housing, Resources and Investment for a Vibrant Economy (LA THRIVES) and the Alliance for Community Transit Los Angeles (ACT-LA) coalitions. 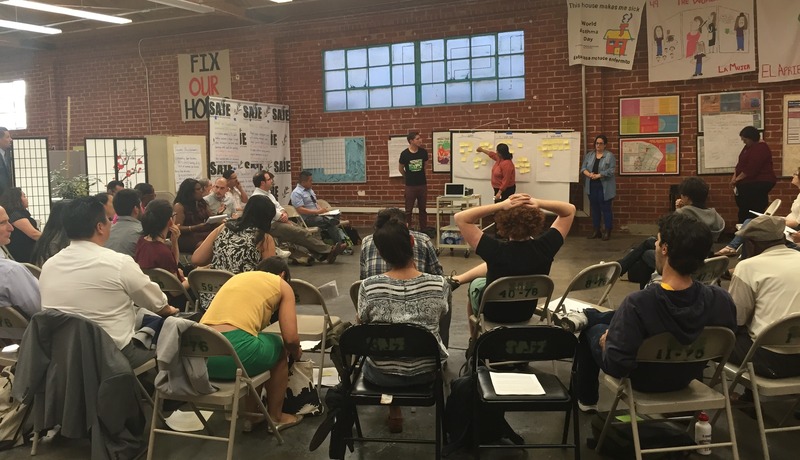 Together, these groups are working to change the region’s discriminatory legacy and enable every Angeleno’s pursuit of economic stability and good health through affordable homes, quality living-wage jobs, and accessible low-carbon transportation. The partners’ shared goal is to harness existing investment to create more affordable housing, ensure existing residents can stay in their homes, extend the reach of the region’s public transit system, and expand green infrastructure vital for improving local water resources. The Los Angeles SPARCC collaborative partners have identified a strategic approach that leverages community organizing and investment in strategic jurisdictions across the region, including the City of Los Angeles, Los Angeles County Unincorporated, Long Beach, Inglewood, and the Southeast Los Angeles sub-region. Support the preservation and construction of affordable homes connected to transit. Promote policies that protect low-income renters vulnerable to displacement, particularly around transit stations and new infrastructure investments. Accelerate investments in bicycle, pedestrian, and shared-mobility infrastructure. Build capacity for innovative community-led green infrastructure. Los Angeles is experiencing a profound housing affordability crisis that has pushed issues of housing insecurity and homelessness to the front of public consciousness. Meanwhile, the state-wide drought and other dire impacts of climate change have elevated calls for change. Historically disparate investments and policy impacts have resulted in economically and environmentally distressed neighborhoods like Boyle Heights, a predominantly Latino community in East Los Angeles. Decades of freeway construction confined Boyle Heights to a tightly constricted pocket of ever increasing pollution and restricted residents from a full range of opportunities. Download the SPARCC Los Angeles Regional Profile.